The World Parkinson Congress and why you should be there with me! 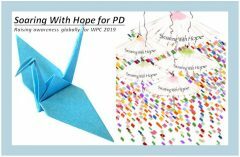 The 5th World Parkinson Congress will take place in Kyoto, Japan on June 4-7, 2019. These meetings are unique and deserve both our attention and support. It is not just that the meeting brings together doctors, patients, researchers, caregivers, and other allied professionals together for 4 days to talk about all things Parkinson’s. It is also not just that there are a variety of session formats and sizes that will highlight new research, models of care, and collaborations that are changing the lives of those living with Parkinson’s today. If it is even remotely possible that you can attend you owe it to yourself to seriously consider it. What can you expect? The opportunity to meet people from around the world who are making a difference for those of us living with Parkinson’s. The opportunity to get to know other PwPs from around the world and to make new connections and, quite possibly, meaningful and close friends. The opportunity to learn the most up-to-date news about all things Parkinson’s. Registration begins next week on September 10. The website is https://wpc2019.org/ (or you can just click here). If you are interested in volunteering, click here for more information. If finances are an issue, travel grant applications will also be available in December. One last personal pitch. Before you go, or even if you cannot go, make sure to participate in our “messages of hope.” Three women who became good friends of mine at the 2016 WPC– Naomi, Clara and Amy — were so inspired that they created a global project, Soaring with Hope 4 PD, to promote hope for People with Parkinson’s Disease. Their goal is to collect at least 12,000 messages of hope to be written on origami Cranes that will be part of an art installation at the Congress. Let’s all take the time to contribute to that. * As an blogger, my “official” duties will be sharing my experiences. But I hope to do more than that. It would be wonderful to meet any of you who will be attending and also to create a photo gallery on the blog of as many of the PwPs I meet there as possible. So please let me know if you plan to go.